Our Policy and Civic Engagement department is committed to maintaining collective efforts to uplift our communities. Our department firmly believes that all people have something to contribute to our movement and we would love you to be a part of it! Our organizing efforts at a local, state, national and international level empower our communities into action on a variety of issues affecting our constituencies. Please call our offices at 1-877-881-8281 to let us know that you are ready to get involved. Together, we can move mountains! Si Se Puede! Key Components Agricultural Worker (“Blue Card”) Status: The bill provides a one-time opportunity for experienced agricultural workers to apply for legal status if they show consistent employment in U.S. agriculture over the past two years, pay a fine, and aren’t ineligible due to criminal history. ELIGIBILITY FOR THE BLUE CARD IS LIMITED TO WORKERS WHO CAN PROVE EMPLOYMENT IN U.S. AGRICULTURE FOR AT LEAST 100 WORK DAYS OVER THE LAST 2 YEARS. ALLOWS FOR SUBSEQUENT ADJUSTMENT TO PERMANENT RESIDENCY (“GREEN CARD”) FOR AGRICULTURAL WORKERS WHO CONTINUE IN AGRICULTURAL WORK. IN ORDER TO ADJUST TO PERMANENT RESIDENCY, WORKERS MUST PROVE EMPLOYMENT IN U.S. AGRICULTURE FOR AT LEAST 100 DAYS PER YEAR OVER THE NEXT 5 YEARS OR 150 DAYS PER YEAR FOR THE NEXT 3 YEARS. THE AGRICULTURAL WORKER PROGRAM ACT OF 2017 PROTECTS EMPLOYERS WHO HAVE HIRED BLUE CARD ELIGIBLE INDIVIDUALS FROM CIVIL PENALTIES. THE AGRICULTURAL WORKER PROGRAM ACT OF 2017 DOES NOT AMEND THE H-2A VISA PROGRAM AND NECESSARY REFORMS ARE STILL NEEDED TO THAT PROGRAM. THE AGRICULTURAL WORKER PROGRAM ACT OF 2017 IS MODELED ALMOST ENTIRELY FROM THE AGREEMENTS STRUCK IN THE COMPREHENSIVE IMMIGRATION REFORM (CIR) PACKAGE IN 2013 WHICH EARNED 68 VOTES WHEN IT PASSED THE SENATE IN 2013.
the petition requesting that California Attorney General Xavier Becerra launch an investigation. The Delano police report supports the conclusion that the family's SUV was traveling at a high rate of speed while desperately trying to evade ICE agents when they lost control, hit a utility pole and their vehicle overturned on its roof. 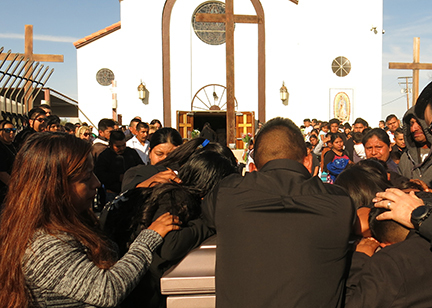 However, the police report on this fatal crash contradicts ICE agents' claims that they were not following behind the farm worker couple with their emergency lights on. It is deeply distressing that ICE agents' statements are contradicted by a surveillance video showing two ICE SUVs traveling behind the couple's vehicle with emergency lights activated, according to the Delano Police Department report. Why did the two ICE agents choose to misrepresent whether they were following the couple with their emergency lights on? And, why did ICE agents follow the couple if they were not ICE targets? Despite the report, the Kern County district attorney refused to file charges against ICE. So we need to take it to the next level and ask California Attorney General Xavier Becerra to launch an investigation. Please sign the petition today! We will turn the petition in later this month.